EXPLAIN IT WITH MOLECULES-- WHAT IS THE DIFFERENCE BETWEEN CARBYNE AND GRAPHENE? Graphene is a one-atom-thick planar sheet of sp2-bonded carbon atoms. Graphene is the basic structural element of some carbon allotropes including graphite, carbon nanotubes, and fullerenes. The Nobel Prize in Physics for 2010 was awarded to Andre Geim and Konstantin Novoselov "for groundbreaking experiments regarding the two-dimensional material graphene". For a more detailed description of graphene see our graphene 3D molecule page. 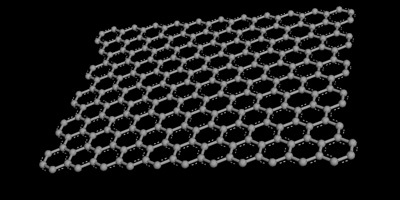 Image of graphene -- a two dimensional plane of carbon atoms. Carbyne (Linear acetylenic carbon) has been in the news lately as a structure that is possibly the worlds strongest material that has great potential if anyone can make it in bulk. Carbyne is basically a chain of single carbon atoms, but having twice the tensile strength of graphene , and three times the tensile stiffness of diamond (1,2). The chemical structure is repeating chain with alternating single and triple bonds --- ...Because it is just a single strand of molecules it is often referred to as "one-dimensional" structure. 1-- graphene is great conductor; electrons are able to flow through graphene more easily than through even copper. 3-- graphene is harder than diamond and about 300 times harder than steel. 4-- You can stretch graphene up to 20% of its initial length. It is expected that graphene’s mechanical properties will find applications into making a new generation of super strong composite materials and along combined with its optical properties, making flexible displays. 5-- Graphene, despite being the thinnest material ever made, is still visible to the naked eye. It absorbs a high 2.3% of light that passes through it, which is enough that you can see it in air. 2--Under appropriate termination, carbyne can be switched into a magnetic semiconductor state by mechanical twisting. 3-- Carbyne chains can take on side molecules that may make the chains suitable for energy storage. 4--Carbyne might be the highest energy state for stable carbon. 5--If outfitted with molecular handles at the ends, it can also be twisted to alter its band gap. With a 90-degree end-to-end rotation, it becomes a magnetic semiconductor. 6--carbyne can acquire links with side chains, and these chemical bonds could be made and broken for the storage and release of energy. 7-- Stretching or twisting carbyne changes its electronic properties. .Source: see abstract below (Rice University. Theoretical physicist Boris Yakobson).